You may not have heard of this small airline based in Ponta Delgada. , However, they fly from there to many destinations in North America, Europe and Africa. They have a fleet of 7 aircraft and offer business and economy class service, I booked a return flight from Lisbon to Ponta Delgada in business class to check out what this airline offers inflight to premium passengers. It was a lunchtime service from Lisbon to Ponta Delgada and the flight time was around 2 hours. 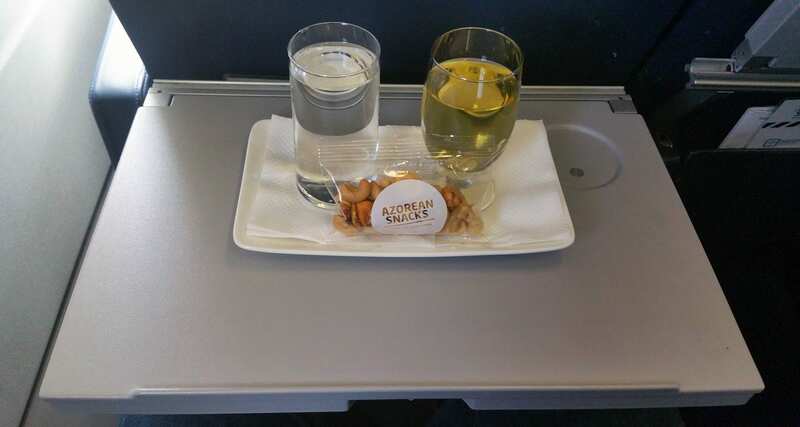 Firstly the airline offered a drink service and served a small bag of Azorean snacks. After the drinks service lunch was served which consisted of Chicken served with beans and courgette. It was served on a well presented tray along with a bread roll and a muffin. I didn’t like the meal at all, I felt it was quite bland and lacked some quality and taste. Before the flight departure, I decided to check out the airline’s lounge, which was quite a lovely space and very quiet indeed. 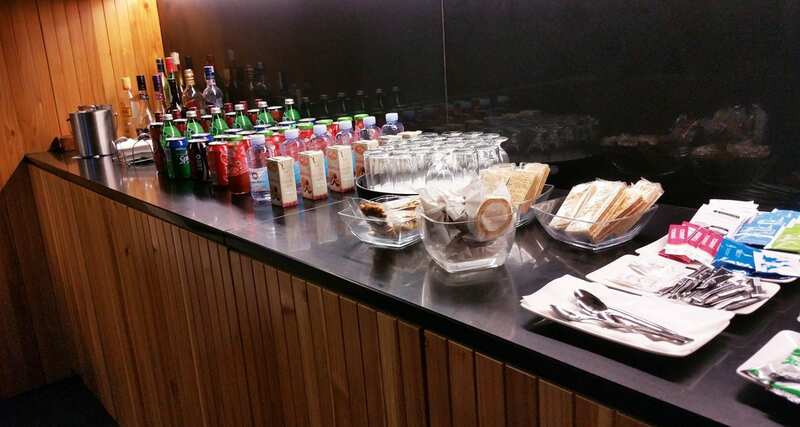 There was no fresh food available, however, quite a good range of drinks and packaged snacks to choose from. It was an early morning departure from Ponta Delgada and I flew on the airlines A330 service to Lisbon, which I was quite excited about. I wasn’t too sure what they would serve inflight, and tried to keep an open mind about things. There’s that muffin again! At least there’s some fresh fruit this time too. I usually don’t drink tea or coffee inflight and try to stick to water; they offer the Pedras Salgadas range which is from the North East region of Portugal. 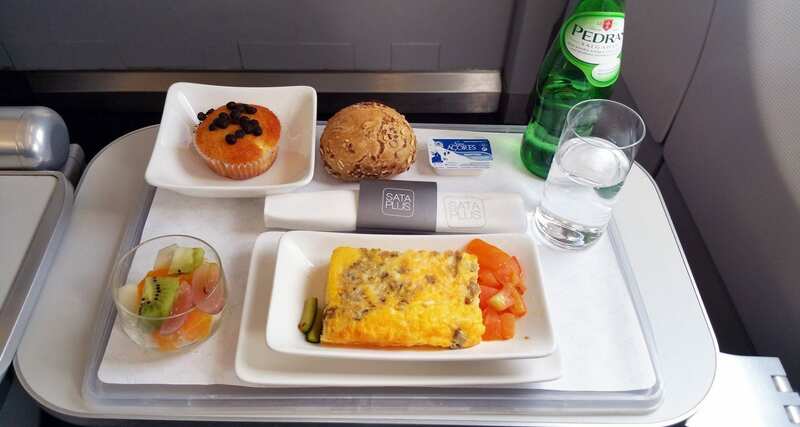 The main meal was an omelette with cheese and mushroom; it was quite bland again and rather rubbery, but slightly better than the previous meal that I ate on my earlier flight with them. Generally, the inflight service was quite good, the crew spoke excellent English, and they worked efficiently. It wasn’t a fantastic inflight service experience, but not horrible either. 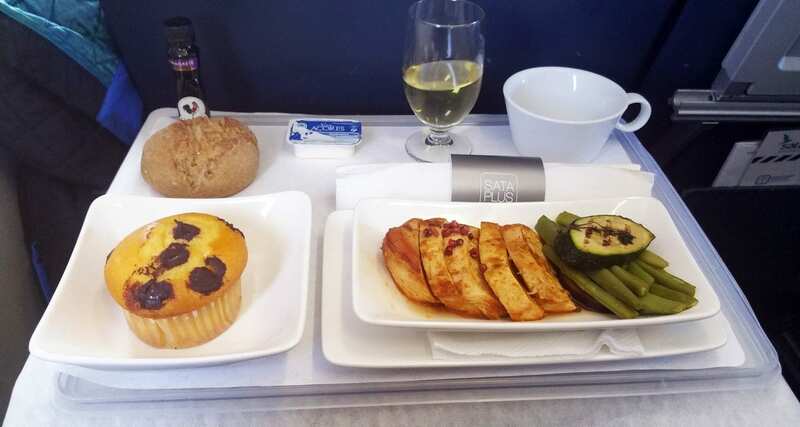 The meals could do with a bit of an upgrade however on the plus side the offering was quite good considering the short flight time.